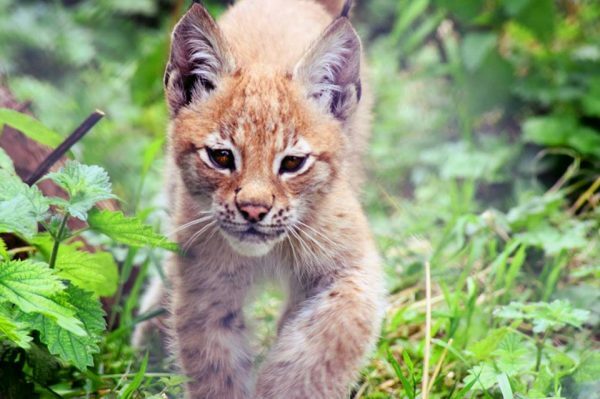 A young Eurasian lynx has escaped from an animal park in Wales. Borth Wild Animal Kingdom near Aberystwyth have advised the public not to approach the large cat, called Lillith. “Do not be alarmed, but please be alert,” the animal park, that is a popular tourist spot, wrote in a Facebook post. “If you spot her, please do not approach her. Phone the police or contact the zoo straight away. We have fully trained keepers on hand to deal with the situation,” warned the Borth Wild Animal Kingdom in a Facebook post. Police helicopters spotted the large female cat near the park on Sunday evening, and further attempts to locate her will be made today, Monday Oct. 30. Dyfed-Powys Police have advised the public to not approach the wild animal, per ITV News. The lynx is described as having a distinctive “stubby tail” that is around 6 inches (15 cm) long that is tan at the base and black at the tip. She is around twice as big as a domestic cat, and is tan and white in colour, with dark spots on her back and legs, and black tufts on her ears. Last year, a lynx went missing for three weeks from Dartmoor Zoo according to the Independent. Flaviu, a male Carpathian lynx fled the zoo the day after he arrived, by chewing through a board in the wall. Anyone with information about the missing cat should contact Borth Wild Animal Kingdom on 01970 871224.